Live Lightly Tour » Essential USA Giveaway! Oh gosh, there are too many favorite places since I love to travel! I’ll begin with the one nearest to me: Mount Mansfield, Vermont’s highest peak. It’s a family tradition to climb this mountain every year to see the fall foliage. We take the auto road in Stowe up to a parking lot near the ridge, walk 1.5 miles along the ridge to reach the peak. Absolutely gorgeous. Every year the views take my breath away and remind me why I can never live anywhere else but Vermont. P.S. 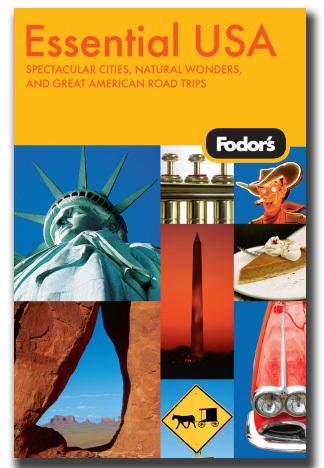 I love Fodor’s travel books-for every country I visit, I buy Fodor’s! Their off-the-beaten path suggestions are awesome! we road tripped up the east coast to Maine. I remember the blue flowers, the REALLY bumpy roads, the blue glaciers, and the majesty all around. In eight grade I spent a month traveling the Alaska roadways with my family. Denali National park, a glacier day cruise, and a sweet bed and breakfast called Blueberry Mary’s are vivid memories to this day. I WILL go back! Favourite… that’s hard. I’d have to say the trip I chaperoned a van load of teenagers on a trip to New Orleans (from Canada, y’all). I loved a family trip to the “four corners” area in 1998. It really opened my eyes to the spectacular scenery of that area! My favorite road trip was with our daughter when she was 2. She had just learned to use the potty and when she had to go, she had to go. We were traveling from Pennsylvania to Florida. She had to go…so we stopped along the road, got her little potty out, and she sat on it on the side of the road. Next thing we know, there is a police officer walking up beside us asking if everything was alright. “Yes officer, our daughter just had to use her potty!” He looked at us like we were insane, but when you gotta go, you gotta go!! We roadtripped a lot when I was a small child, always camping or, on one memorable cross-country trip, using a pop-top camper. One night in Colorado we camped on the side of a mountain. Each site seemed precariously perched on a 20 foot dropoff. Lo and behold, an enormous storm blew through the area and shook the life out of our little camper. My brother’s pup tent almost blew off the cliff. I’ll never forget it! I was born with the travel bug, my parents were not, which is what makes a surprise 3-week vacation with them to the western part of the US in the fall of 2005 so memorable. I met them in SD. We went into WY, up to MT and back into WY. Forget San Francisco…this little southern gal left her heart in Big Sky country!!! Standing on a ridge somewhere outside of Jackson Hole, WY…I witnessed why they call it Big Sky country-never in my life have I ever seen so many stars at one time, absolutely breathtaking-then I was almost mauled by a pack of wild coyotes, but that’s another story. I’m about to head out for my first road trip ever this summer, as a college junior! My family has traveled quite a bit through my life, but we’ve always flown to our destinations. This summer’s trip is different because we are bringing an Amish friend with us! She isn’t allowed to fly…hence the road trip! My mom and dad and I are excited to have her with us…and I’m excited to get to see more of the country from the ground. My favorite travel memory is a combination of a few different trips. My parents and I are working on “summitting” all of the state high points in the US. So far it’s been a fun adventure! Now we try to fit a different state into wherever we travel. The mountains we’ve completed range from Mt. Elbert in Colorado, the 3rd highest of all the states, to Ebright Azimuth in Delaware, the 49th highest! As you can imagine, Mt. Elbert had absolutely amazing views, and Ebright Azimuth…well, as you can imagine, getting “up” that one was rough! My hubby and I went to Alaska for our honeymoon and it was awesome…so natural and untouched. I can hardly wait to take my family back. Love your blog. Vermont has to be one of my all time favorite places. However, we just took a trip to Portland, Oregon, and I absolutely loved it! it’s so fun seeing other parts of our great country! I love the drive from Washington to northern California – long, yes, but the change in scenery is so lovely! I live in NC in the piedmont region so in 1.5 hours I can be at the beach and in 4 hours I can be in the mountains. I love day trips to Asheville just because I want to walk the streets with people like me. I love road tripping to the beach on a “sick”day just because I need to get away. i have driven from the LA area to Durango, CO several times and it is a gorgeous road trip. Once when we took the northern route (through Utah and Grand Junction) we were so awestruck by the beauty of Utah that we stopped several times to get out, look around and take pictures even though it meant we got to our destination several hours later than we planned! My favorite roadtrip was from IL to Toronto. That city is beautiful and so lively. I was just sorry the trip was so short. I want to go back! When I was on a road trip in my late 20′s through Yellowstone and the Grand Tetons with my best friend (we’re from the east coast). That part of the country is some of the most beautiful I have ever seen. We were camping and under many must-be-fate circumstances it happened upon a hike that I met my future husband, now of 20 years. The west still has my heart and I yearn to go back there and bring our 13 year old daughter to see those wide open spaces. Definitely Madrid (pronounced MAD-DRID) New Mexico. A cool old mining town you reach on the (alternative, winding, and old-fashioned) way to the mountains, or alternatively, on the way to Acoma Pueblo. Be sure to have the green-chile and take a picture with the buffalo mounted on the wall. Our favorite place to visit is Nova Scotia. We went there on our honeymoon and a year later, we went back for our first anniversary. We found out, on that trip, that we were expecting our first child. That was back 1998. Since then, we’ve gone back a few more times and brought our children with us. They love it as much as we do. My favorite trip is to Williamsburg, VA. I was homeschooled, and went as a child with my family. We went in the fall and I remember being absolutely captivated. We revisited last year (my mom, sister, my boys and me) and stayed in the same place that we stayed when I was a child. It was just as wonderful as I remembered. The house we live in was carefully designed after a Williamsburg home, and I love to go there now and see how even small details were captured in our home (working shutter dogs!) and to get ideas for the landscaping and gardening. We just returned last week and it is absolutely one of my favorite places to visit in the fall. Virginia is such a beautiful state, and I have such strong memories and affections for Williamsburg! Probably going to Graceland in Memphis, where my husband proposed to me! my favorite times have been when my husband and i have driven through any portion of the smokey and blue ridge mountains. especially in the morning while the sun is still breaking–simply stunning. it is actually that much more stunning if you are hiking it and not simply driving. When we were growing up we’d take little trips in our motorhome (and camper before that!) – one of my favs was Big Sur in Cali. It had the best… forest and cliffs and the ocean. What more could you ask for? Thanks for the giveaway! Love your blog and wish we could travel more. My most memorable road trip would have to be last year when we moved home from Boston, MA to Lincoln, NE. Our sweet baby boy was less than a month old and we packed our car to drive across country to move back to our roots. Fall is our most favorite season and to see the autumn decor in so many states was fabulous. There is something so exciting about not knowing where your next stop will be. We drove through sunshine, rain, and snow and pulled into the farm Thanksgiving day for a warm meal and a happy family excited to meet our bundle of joy for the first time. I have a a lot of great memories of fishing in northern Minnesota with my parents . No t.v. was allowed and all we did was play games and talk and laugh. It was such a restful vacation. My children were small and it was a wonderful way to do fun things with them. Hi! We haven’t been able to travel much, but this last Spring,we took a day trip to the Headlands State Park Beach area , on Lake Erie. It was beautiful. The water was so immense, the horizon so far away& the wind blowing in your face.I’d like to live there.There is a real lighthouse and the area is full of shipwrecks and history. Here is the State Park website . As you can see there are lots of interesting things to see & do here. One of my favorite trips was spending 4 months in the W. Virginia woods living in a tent working with inner city children from Washington D.C.
Talk about living small – living large. My favorite place is Little Lakes Valley, near Tom’s Place in California. We went there in October and the fall colors were just gorgeous. With its sparkling lakes, creeks, and surrounding high sierra peaks, it is heaven! One of my favorite memories of road tripping was a summer trip from Denver with the destination being the Grand Canyon. My friend Sarah & I decided to explore on our way and after traveling through southern Colorado, we headed north into Utah. We ended up doing a huge loop through Canyonlands National Park, absolutely fascinated and in awe of the beauty of the desert landscape! As we headed south towards the Arizona border, we drove through Fry Canyon – it was an oasis of green foilage and red rock walls. We pulled over & got out, listening to the peaceful silence. And when the silence became too much, Sarah pulled out her guitar & we sang in worship, in awe of the Creator of the loveliness we were surrounded by. A spontaneous detour became the most memorable part of our ‘planned’ trip. our last trip was pretty bahl! We took a trip from Florence, Oregon to Buena Park, California and rode as much ofthe coast we could. Driving the motorhome down the 1 was nervewracking at parts, but worth it. There are some routes I won’t be driving twice! The highlights were the massive redwoods where we dropped off a cardboard cut out of Princess Leia. She was in our wedding and has traveled with us for over 6 years, but has seen better days, so we let her spend the rest of days in peace on “Endor”. The highlight of the trip has to be Boonville, California, a place nobody I know had ever heard of, that over time began to speak their own language. The language is called Boontling. It started in the 1880′s and and one time was spoken by the majority of the citizens in the town, it was even taught in their schools as a second language. Sadly, only 6 people still speak Boontling fluently. And we randomly ran in to two of them at a local coffee shop. It was amazing! Hearing is believing. On our blog we have some audio to listen to if you are interested. Thanks for the opportunity to win the Essential USA book. Any guide that keeps us seeing things and places we never heard of before is a blessing. several years ago after serving in the israeli army, i took a road trip in the USA and Canada with my then girlfriend. she was more interested in “getting there” then “being here.” when we came to yellowstone i wouldnt be rushed through the opportunity to relax in the soothing hot springs. the month was march and there was snow on the ground. my girlfriend couldnt be bothered to hike a half hour in the snow so i went by myself. i followed the trail to where the scalding water from the hot springs mingled in a pool with the freezing waters of the yellowstone river. i sunk myself into this perfect water, took a deep breath and looked around me. the breath became a gasp as i found myself the lone human in this snowy wilderness, but not alone because i was surrounded by herds of bison and elk, and plenty of deer. what a contrast from the quiet and empty deserts of israel! that very moment is the one that i would like to last all eternity when i leave this earth. Since graduating highschool and much to my parents dismay I have taken a few road trips…from Illinois to Louisiana and to Texas…but my most favorite was my trip to Bar Harbor, Maine to see my best friend Penny. I’ve known her since Kindergarten and this was my first trip with my son who was 3 at the time. It was absolutely gorgeous. We went to Acadia National Park and visited Sand Beach, Thunder Hole, Otter Cliffs, Jordan Pond, and Cadillac Mountain…which was amazing! What views! We also seen Mt. Desert Island. We had so much fun jumping on the rock-bound coast and climbing the soaring granite cliffs. We gazed upon the coast from Bass Harbor Head Lighthouse for hours. From the stonewall-lined and tree-covered road leading you into the village, it was truly a magical place to experience with my best friend and my son! I couldn’t have asked for a better trip! I would love to thank you for inspiring us and allowing us to experience your families adventures with you!